Vent Filters from Foxx Life Sciences fit perfectly with EZgrip carboys. The PTFE filter membrane makes it ideal for maintaining purified water stored in carboys. Bioprocess Carboys are superbly designed with EZ Top Caps and single-use EZ Top Assemblies for advanced sterile liquid handling and solution storage for many laboratory & bioprocess applications. This class-leading Bioprocess Carboy range covers sizes from 2.5 Litres to 75 Litres, made from high quality Polyproplyene, HDPE and PETG. 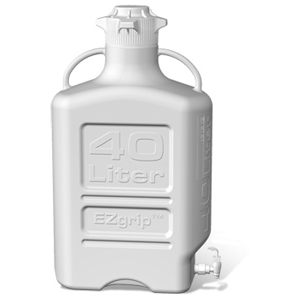 The bioprocess carboy design allows you to easily hold, lift, fill, and pour while the versatile EZ Top® Container Closure technology provides interchangeable and leak-proof top connections. Single-use EZ Top assemblies for aseptic fluid transfer, handling and sealing are available in a choice of two resins: C-Flex® thermoplastic elastomer and Sani-Tech® high-purity platinum-cured silicone. The Bioprocess Carboys are available with or without an autoclavable spigot. They also feature easy-to-read certified graduation marks with ± 5% accuracy and large molded marks for clearly identifiable volume and material. The carboy, cap, and spigot are all autoclavable. To further discuss the Bioprocess Carboys range, and how we can help you. Please contact us, or request a callback at a convenient time to suit you.